It felt natural that the first few posts of the year would be about leaving things behind. Go ahead and kick a few old nasty habits in the teeth, because there isn't any room this year for anything but the good stuff. Every time you say, "change is scary," it becomes scarier. You should be saying, "change is easy," and "change is fun." Heck, it's exhilarating and everything you've ever wanted requires a large serving of discomfort. You need to create space for the better. Think of your life as a five-seater car with room for five people—nobody is squishing into the trunk, sitting on someone else or otherwise sardining in. There are five seats and one is yours. Let's say that the other seats are taken up by your high-school bestie, your mom, a sibling and your dog. How are you going to fit the cute photographer in? You know, the one from the choose-your-own-adventure of life that will introduce you to the guy who'll meet you for coffee and that moment in time will set you on your path to the movie deal. Feel free to insert whatever dream you want on the end of that one. Leaving your high-school bestie at the side of the road might be awkward, but maybe you can pick him up later or remember that he's good at hitching it and part ways with a hug and a fist bump. The point is that you need to make room, get a bigger car or downsize to a scooter. Your life is yours by design, not happenstance. Saying you like things when you don't—pretending is so last season. Offering to do stuff you have no interest in doing. Unless this is helping your sick neighbour, you shouldn't feel guilty about not making an offer to help. Practicing having a spine and saying, "No" when you mean it. Donating something to someone who needs it more. Letting go is a behaviour that needs to be practiced on a regular basis to make it easier. Sugar, caffeine, negative people, the other usual things... this list could go on and on. Nothing, you were probably overloaded and need less not more. Time to yourself. To be bored. To relax and allow life a moment to tell you what to do next. When was the last time you had an extra moment to ponder how you got here? Colouring. It's a therapeutic activity that allows your mind time to go to the park and take a break. It's a great alternative to meditation. Finding a new friend with new ideas that challenge your own. Pursuing your passion. Notice that we didn't start off with this the big one, we eased you into it. Is your life slipping through your fingers? 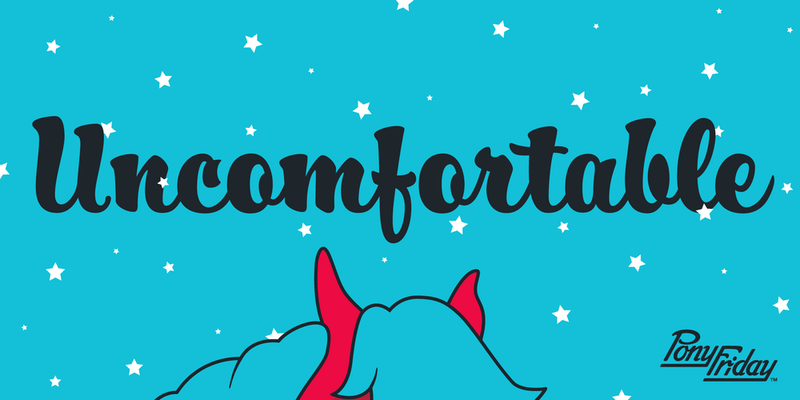 Are you afraid to be uncomfortable? If you aren't doing what you want, you're wasting your life. We don't want that for you. We want you to put in the effort and turn your caterpillar-like life into a beautiful soaring butterfly... or galloping pony. Tell us what you're doing to push yourself this year.